Carrying your stuff around doesn’t have to be difficult. In fact, it can be quite simple if you have the right bag. But who wants to carry a heavy briefcase or duffel bag around with them all the time? Even a backpack can get too heavy sometimes. That’s where sling bags are a great idea. They carry a few items at a time so you’re prepared but don’t get in your way. Of course, choosing the best sling bag depends on just what you want to use it for. Material: What is the bag actually made of? This is going to impact how durable it is and how long it’s going to last. It also affects how much you can actually store in the bag without worrying about it breaking. Dimensions: How large is the bag? Again, this will impact just how much you can actually put in the bag before it’s maxed out. It also affects how comfortable you’re going to be when you carry it around with you. Color Options: Does it come in a lot of colors? Sure, this is a personal preference, but it’s something you’ll at least want to know about, right? So, take a look at how many colors you get to choose from before you pick one. Purpose: What is the bag actually designed for? 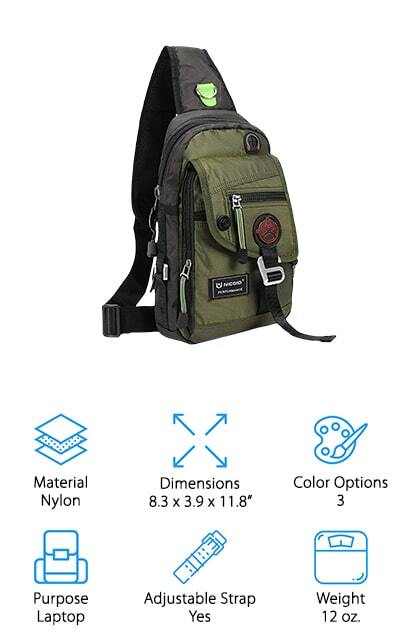 You might think sling bags are all the same but some are designed for hiking or camping, some are for fashion and some are even for your laptop or a CCW. So, choose carefully. Adjustable Straps: Does the bag have full straps and can they be adjusted? This could make it easier for you to carry and could also make it more comfortable for you. You can adjust where the bag sits on your back. Weight: How heavy is the bag itself? You want something lightweight because you’ll have to carry the bag as well as the weight of your items. But too light could mean the material isn’t very high quality or durable. Sling bags are literally everywhere. In fact, you can find them at any store, online and even as a free giveaway at plenty of special events. So how do you make sure you’re getting one that will actually work for what you need? Well, it’s going to take a lot of research and work, or you can take a look at our top bags and see which one of these will work for your needs. You may be surprised just what these little bags can do. This 100% cotton bag will allow you to carry just about anything you want in a fashionable way. There’s no need to use a boring bag no matter where you’re going or what you’re doing. This one comes in over 80 different color and pattern options to match your personal style. It’s also a sling style backpack with adjustable straps to fit you better and zippered compartments that allow you to separate and organize your belongings. This bag is small but still large enough to carry the things you need for the day. The unique rope style shoulder strap gives it a little different look and the sling style is comfortable to carry. Designed to fit your body comfortably, this bag is comfortable across your back and it’s simple to wash by hand if you happen to get dirty. Flip it to the right or the left for your preference and you’ll be all ready to get going. Our budget pick could be one of the best CCW sling bag options, but it could be a whole lot of things. It comes in 9 different colors and works great for carrying your laptop and a whole lot more. You can easily switch the strap from the right or left to fit you more comfortably and you can adjust the length as well. 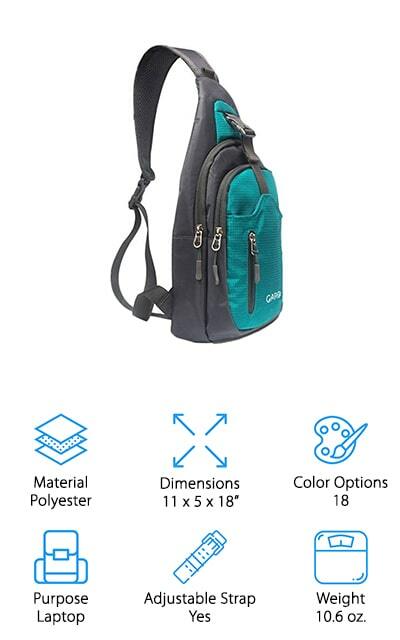 This lightweight bag fits your body and has plenty of zippers and pockets to make sure you can store anything you want easily. Small enough that you can keep it with you all day, it’s also large enough to carry quite a bit. You’ll get a padded strap and back as well as an anti-theft pocket that lets you store away your valuables. It fits well for men or women and is made with a durable nylon so it’s easy to clean and strong enough for daily use. 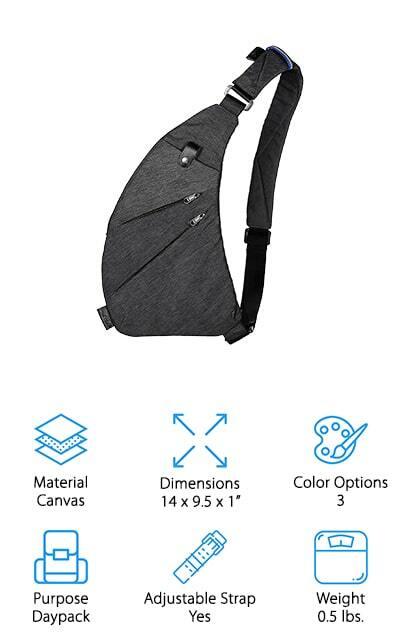 Here we have one of the best iPad sling bag options. It’s a slightly larger bag than some of the sling options you’ll find, but it is definitely still convenient. You can easily carry your iPad and a whole lot more in here and you get 10 different options for colors as well as different size options. 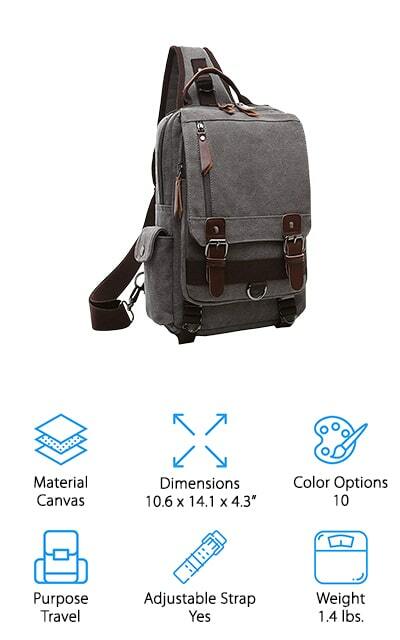 The strap adjusts easily to make sure it’s a good fit for you and the accent of the leather straps on the canvas give it a unique style that definitely lets you showcase your own personality. 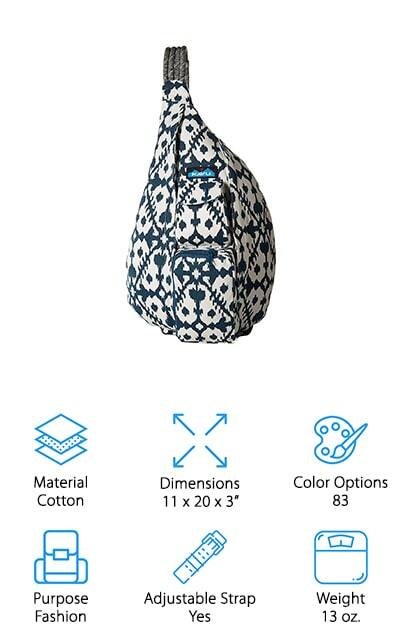 Plus, with all the pockets, zippers and latches you’ll be able to separate your belongings easily. You’ll be able to keep your items secure and you can use this bag for outdoors, heading off to school or anywhere else you might want to go. Use it as a sling or a cross-body bag so you can carry everything you need. Here we have what may be the best men’s sling bag or the best tactical bag for anyone. It’s a rough and rugged style that definitely looks like it can stand up to anything. 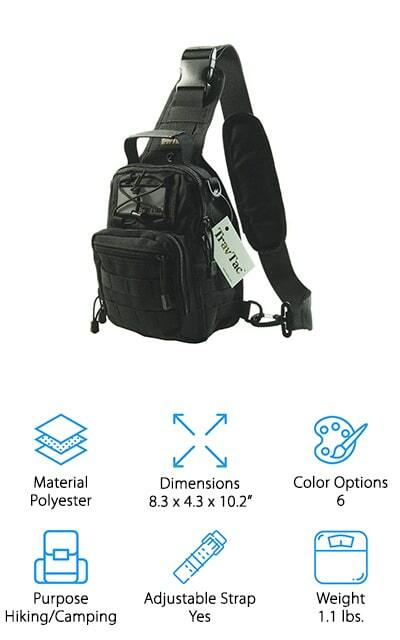 The polyester design is durable and the straps allow you to connect anything to the outside of the bag with ease. You also get plenty of pockets on the outside and the inside to make sure all of your belongings are stored away safely and organized just the way you like. This inexpensive pack can be slung over one shoulder or worn crossbody for more versatility. Choose from several different colors for your own personal preference and even switch between a right-side carry and a left side carry. Whether you’re using it for everyday or for special occasions, this bag will definitely help you stay prepared. If you’re going to be traveling you want to have the best sling bag for Disney World. It’s going to help you carry everything that you need while also making sure you don’t get weighed down. This bag is a great option for someone who wants both. It’s available in 18 different colors to match your own personal preference and it comes in different sizes as well. Even better, it’s made with a durable polyester so you know it’s made to last for a long time. There are several pockets and zippered sections in this bag that let you keep everything organized and the entire thing is padded and provides you with a breathable material, even for the hottest of days. Adjust it to fit over your shoulder or across your body. If you want the best sling bag for iPad you might just find it here. This vintage-inspired bag is all about giving you something fashionable but definitely useful. It’s versatile enough to carry just about anything you want and more. It’s available in several different colors to match your own personal style and it has an easily adjustable strap so you can get the right size. Slid it over your shoulder or carry it crossbody and take it anywhere you want to go. It’s great for outdoors, travel or just wandering around town for the day. You’ll have no problem getting everything you need in it. There are plenty of pockets and zippers to make sure you can have everything organized the way you want it. It also holds up to a 13” laptop so you can be prepared for school or anything else. Lightweight and made with durable canvas, it’s good to go. 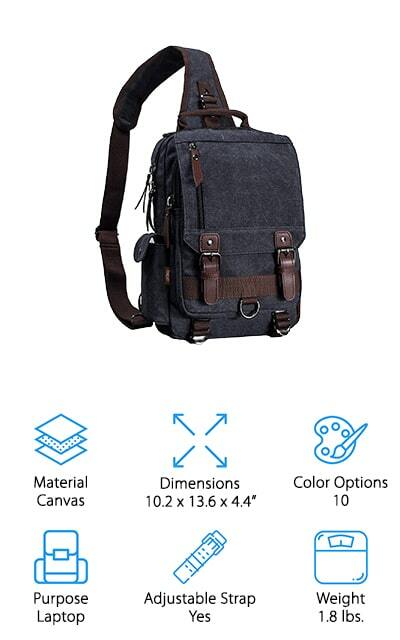 If you want the best sling bag for laptop this might not be the ideal way to do it, but you will be able to get some great features. It’s ambidextrous so you can easily switch it from right to left for your own preference. It also works across our back, over the chest, over your shoulder or just in your hand. The zippers allow you to separate your items however you like so they’re organized and ready for whatever you need. Even better, the pouch is MOLLE compatible and made with a durable polyester, so you know it’s going to last even with more strenuous use. The size of this bag is large enough to carry most of what you need but not too large for everyday carry. Whether you want to go out hiking or just go on a shopping trip you’ll have no problem using this bag to do it. This may be one of the best sling bags for men options that you’ll find. It’s unique in style and a little bit rugged, making it great for those who want to head outdoors for a hike or any extreme activities. Lightweight and easy to sling over your shoulder, this bag has plenty of pockets to make it easy to sort all of your stuff and keep it right where you want it. Lightweight and water resistant, this bag is made of nylon to make it easy to clean when you’ve spent a lot of time on those outdoor activities. The inner pouch is designed for your iPad or other tablet and keeps it safe while you travel. The strap and the back feature padding to keep you more comfortable and the versatility means you can easily sling it over your shoulder, across your chest or over your back to get a better fit, no matter what your plans. 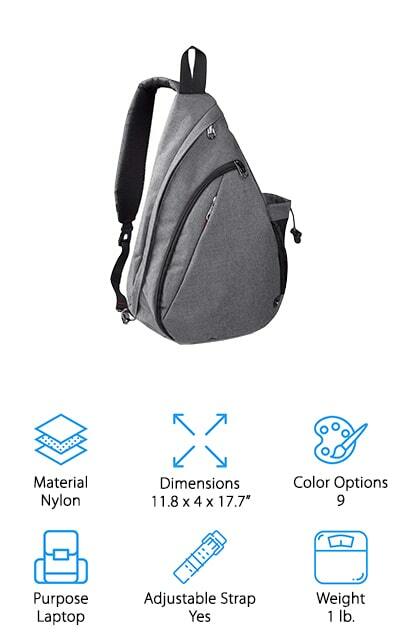 This is likely the best sling bag for travel because it’s small enough to take with you wherever you go but also large enough to carry everything you might need. Made with heavy-duty nylon, these bags are durable and also easy to clean. 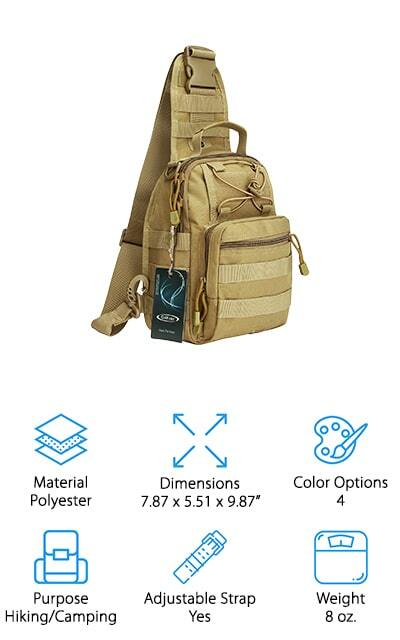 Available in 2 different colors, it’s considered a tactical pack that provides you with everything you need for EDC. It also has several different pockets and zippers that will allow you to access and sort everything that you need throughout the day. The water-resistant pack makes a great piece for heading outdoors. 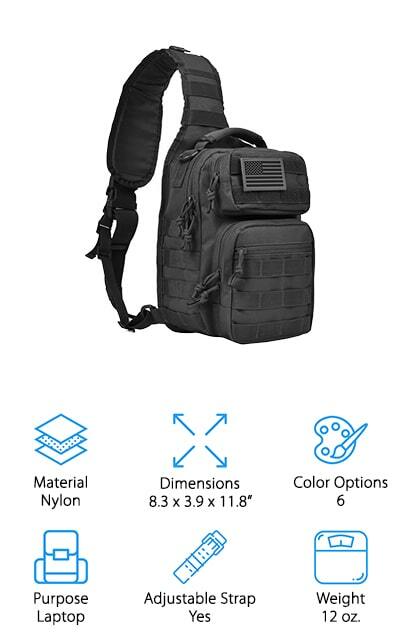 With plenty of space for your handguns, your iPad or anything else you might want to take along, this bag can be slung over your shoulder or across your back easily. The adjustable strap is also great for your personal preference. Here we have possibly the best tactical sling bag, which gives you enough space to carry the smaller items that you may need for the day. It slings over your shoulder easily and provides you with several zipper pockets to sort and organize everything you want. Available in several different colors, this bag fits over your shoulder or across your back. Made with canvas, it’s durable and ready for a day out and about, whether you’re going to head outdoors or you’re going to head out shopping with some friends. Keeping your belongings secure is another important aspect of this bag, which includes RFID protection on one of the inner pockets. This provides you with security so you know your identity is safe. You even get a 6-month risk free guarantee in case you decide the bag doesn’t work for you for any reason.